Feel free to join us at 5:30 PM on Thursday night! Join us in beautiful Brattleboro! VBSR members and friends are invited to a Networking Get-Together Hosted by Mondo Mediaworks. Guests will have a chance to check out where the Mondo-magic happens and hear from our hosts about their commitment to the environment, employee well-being, and sustainable economic developement in Brattleboro and Vermont. Free for members and state/elected officals; $10 for nonmembers. REGISTER TODAY! Whether you're coming from near or far, please consider the impact your travel makes on the environment. Start or join a carpool today, or post a message on our Facebook event page. Looking to grab a bite before or after our event? Head over to our member directory to find a member restaurant in Windham County. Mondo Mediaworks, Inc. is a Vermont-based digital marketing agency with a promise for Vermont’s future. Since forming in 2010, Mondo has been growing steadily and sustainably, creating jobs with livable wages and good benefits along the way. A Certified B Corp, Mondo strives to contribute to the public good through conducting internal happiness tracking, supporting goals of non-profit clients, and providing opportunities for employee volunteer efforts, charitable contributions, and so much more. Join us on the 20th to learn more about Mondo and their commitment to the triple-bottom-line! Brattlebro Savings & Loan is proud to be a deeply connected part of this community. We sponsor events, entertainment, local nonprofits, and initiatives that make Brattleboro the wonderful place we call home. We don’t only do it because it’s smart business, we do it because this is where we live and seeing it thrive is important to us and how we define ourselves and our success. Before the term triple-bottom line was even coined, the founders of Downs Rachlin Martin recognized the importance of actively giving back to the community, being a good corporate citizen, and taking care of their employees. They operate as a VT Green Business, offer comprehensive employee compensation packages, support 15 nonprofits, and provide 500+ hours of free legal services each year. MILK MONEY L3C was launched in July 2015 with a vision to connect “Main St.” as well as accredited Vermont investors with Vermont entrepreneurs to fill a gap in the early stage capital market. It is Vermont’s first registered third-party portal for administering investment campaigns using the Vermont Small Business Offering (VSBO) exemption. Based in Charlotte, VT, it was founded by two seasoned entrepreneurs whose mission is to put the means for creating new businesses, a strong local economy and personal wealth within the reach of all Vermonters. Milk Money is powered by VSECU through its wholly owned, independently operated, subsidiary, Vermont Heritage Financial Group, Inc. Investments made through Milk Money are not federally insured by NCUA, involve investment risk, may lose value and are not obligations of or guaranteed by the credit union. Oak Meadow provides flexible, progressive homeschooling curriculum for K-12. Our experiential, nature-based approach allows families to set their own rhythm of learning and encourages critical thinking and intellectual development through hands-on activities and interdisciplinary projects. Families can use Oak Meadow independently or through enrollment in our teacher-supported, accredited distance school. Personal. Local. Holistic. This is the heart what we do and how we do it. THRIVEeap is a team of dedicated mental health and human resources professionals who are on a mission to help businesses and the people who work in them to be more resilient. We don’t buy into the idea of trying to balance “work” and “life” because how can they be separate? There is LIFE. Let’s make the time we are at work, and outside of it, as healthy and rewarding as it can be! United Way of Windham County strives to improve lives by mobilizing the caring power of the community by focusing on Health, Opportunity, Prosperity, and Education – HOPE. With a focus on promoting financial stability and independence, United Way of Windham County works with the business community to create a stronger workforce by helping employers support their employees. We unite individuals, businesses, and organizations to create long-lasting, measurable change. 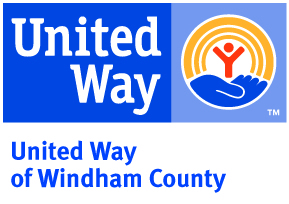 It is truly Windham County's United Way.